Thomas Jefferson was our young nation's most celebrated grandfather. 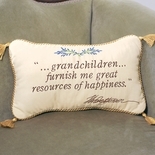 In a letter dated Christmas day 1808, Jefferson wrote: "An only daughter and numerous family of grandchildren will furnish me great resources of happiness." 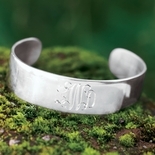 Our bracelet makes a perfect gift, in a sterling silver cuff style that adjusts to fit most wrists and reads "grandchildren...furnish me great resources of happiness." 2 1/2" wide. Made in the U.S.A. Gift boxed.